The ecoSUBs are a new type of Autonomous Underwater Vehicle (AUV) developed by Planet Ocean in partnership with the NOC. The vehicles are less than one metre in length and weigh only 4kg, and are therefore known as ‘micro-AUVs’. Despite their small size, they are capable of diving to 500m and have sufficient battery power to stay underwater for several hours. Two of the new ecoSUB vehicles were deployed from the Royal Navy’s HMS Enterprise during the latest Marine Autonomous Systems in Support of Marine Observations (MASSMO) trial. The ecoSUBs successfully collected oceanographic data to depths of 100m, and these data will be compared with those collected by traditional ‘over-the-side’ instruments deployed from the ship, allowing the Royal Navy and the Defence Science and Technology Laboratory (Dstl) to assess the benefits of this new robotic technology. A Royal Navy spokesperson said: “The MASSMO missions have been a great success in helping the Royal Navy better understand how to deploy and operate marine autonomous systems to achieve good quality data. We were very pleased that HMS Enterprise could assist the mission, both in the launch and recovery of ecoSUBs and collection of data using the ships’ own equipment. We look forward to the analysis of oceanographic data and the comparison of ship and marine autonomous system datasets." 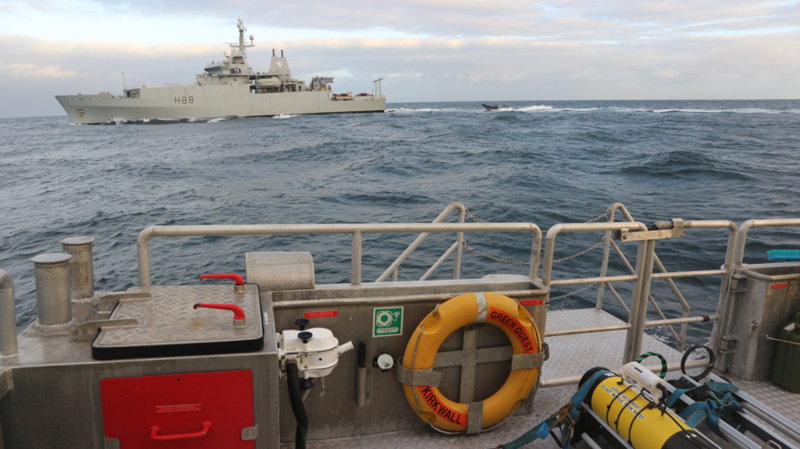 In addition to the ecoSUBs, the mission also successfully deployed two submarine gliders operated by the Marine Autonomous and Robotic Systems facility at the NOC. These gliders were carrying acoustic monitoring devices provided by University of East Anglia and RS Aqua, capable of recording vocalising marine mammals and man-made noises in the survey area up to 100km offshore in the northern North Sea. The marine robot fleet targeted oceanographic features identified on satellite images provided by Plymouth Marine Laboratory, and surfaced every few hours to transmit oceanographic data back to the NOC via satellite. These data were then passed to the Met Office and Royal Navy to test how the data can improve operational forecasting. The mission also provided an opportunity for the NOC, the Scottish Association for Marine Science (SAMS) and the British Oceanographic Data Centre (BODC, also part of NOC) to test new developments in marine robot ‘command-and-control’, and to showcase a new visualisation suite where incoming data could be viewed and analysed; these developments contribute to the Oceanids marine robot development programme, which is part of the UK Government’s Industrial Strategy Challenge Fund. Prof Russell Wynn of the NOC, and Chief Scientist of the mission, said: “For the last five years we have run annual MASSMO missions in some of the UK’s toughest offshore environments, highlighting the strengths and weaknesses of new autonomous technologies. These missions also highlight the innovative approach taken by the NOC towards technology development, industry partnerships, and advice to UK Government. We are now hoping to run similar missions in the Arctic, with the aim of sending the next generation of marine robots under the ice to measure this rapidly changing environment." The annual marine robot demonstrator missions are part of the Marine Autonomous Systems in Support of Marine Observations (MASSMO) programme, co-ordinated by the NOC and sponsored by Dstl. This latest mission – MASSMO5b – included the following partners: University of East Anglia, Scottish Association for Marine Science, Plymouth Marine Laboratory, Blue Ocean Monitoring, Met Office, UK Hydrographic Office, Planet Ocean, RS Aqua, Autonaut, Seiche, Green Marine, and British Oceanographic Data Centre. MASSMO5b commenced on 17 October 2018, and the recovery of the final submarine glider will take place in late November. The survey area is in the northern North Sea to the east of the Orkney Isles, extending up to 100km offshore in water depths up to 150m. The Oceanids marine robot development programme forms part of the UK’s Industrial Strategy Challenge Fund, and includes an investment of £16M in new long-range and under-ice-capable AUVs, miniaturised sensors for deployment on a variety of marine robots, and command-and-control infrastructure to enable optimised piloting of multiple vehicles.